Funeral biscuits took centre stage at an unusual culinary festival in London, as performers dressed in full Victorian mourning gear circulated among visitors to The British Biscuit Festival at The Brunswick Centre. Part of The Fantastical History of Funeral Biscuits from boutique food events business Animal Vegetable Mineral, the performers carried baskets of funeral biscuits for distribution. Each small parcel contained a timeless recipe and two biscuits wrapped in a traditional mourning poem. The performers also enlightened their audience on the evolution and eventual demise of the British funeral biscuit. The giving of funeral biscuits was a widely spread tradition from the late 18th to early 19th century, particularly around the Victorian Era when funerals were at their height of social importance. Visitors also got the chance to personalise a funerary biscuit of their very own. 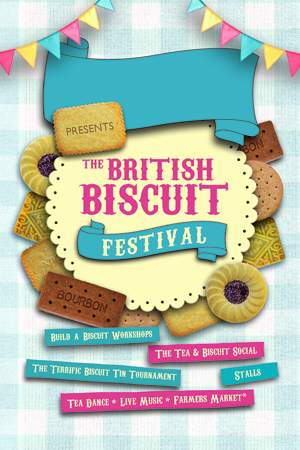 The British Biscuit Festival was designed as a celebration of a British tea-time institution. Besides the funeral biscuits, it featured build-a-biscuit workshops; a Terrific Biscuit Tin Tournament – where competitors tried challenges that included dunking and reciting sonnets with a mouthful of biscuits; a ‘social’ in the living room of ‘Dai Gestive’, and a tea dance. There was also a display of ‘bisc-art’, from the public and professionals; a science event exploring, among other things, the role of the biscuit in scientific exploration and discovery; an Olympic-themed stall celebrating Classic British reinvented childhood favourites and the opportunity to decorate a biscuit with edible paints.